Importance of Protest for Impeaching Obama | Stop Obama Now!! Someone commented on the Internet recently that protests have never achieved anything. It was apparent from his comments that he meant protests had not directly achieved anything immediately. There are a lot of defeatists, who think that way. Conservatives by nature are hardly exhibitionists and the idea of protesting in public just does not much appeal to them. Impeach Nixon Now Demo Protests have had a big impact, though maybe not always for the good from a conservative point of view, being most often used by leftists. Protests helped blacks obtain their civil rights. Protests helped put an end to the Vietnam War. 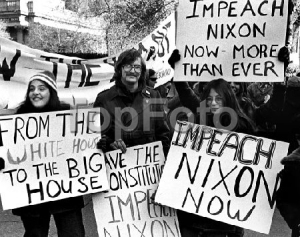 Anti-war protests were a factor in the ultimate resignation of Richard Nixon under threat of impeachment from his own Republican Party.